The Louisiana Elks Association recently held their 82nd State Convention in Lafayette, LA. The members witnessed history in the making as Beulah Rodrigue was installed as the first female president of the association. When Beulah carries the Louisiana flag across the stage in San Antonio, she will be 89 years young. 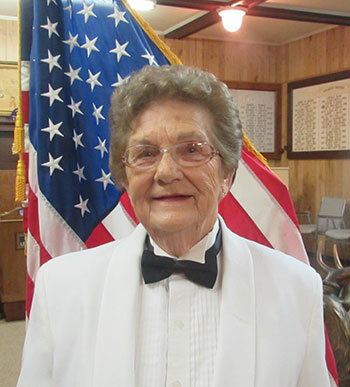 Beulah is a member of Houma Lodge 1193. Among the many honored guest in attendance were State Sponsor/PGER Millard Pickering and his wife Suzanne; Past Grand Tiler/Special Deputy GER Richard Conran and his wife Sue; Past Grand Esquire/State Treasurer Richard Jones and his wife Francis; Past Grand Esquire Sam Echols; Arkansas State President Dennis Darrow and his wife Evonne; Oklahoma State President Gary Lassiter and his wife Sara and Texas State President John Oswalt and his wife Renea. Other newly elected officers are: President-Elect Armand Buuck, New Orleans 30; Vice-President Jim Cade, Shreveport 122; Secretary Buddy Hartle, New Orleans 30; Treasurer Richard Jones, Shreveport 122; Tiler Warren Michel, Houma 1193; Sgt.-at-Arms Sam Authement, Houma 1193; and Chaplain Kelley Rodrigue, Houma 1193. State Sponsor/PGER Millard Pickering announced the appointment of Rene Pelanne, New Orleans 30 as District Deputy GER and the reappointment of Richard Conran of Plaquemine 1398 as Special Deputy GER. Marvin Fontenot of Slidell 2321 was this year’s recipient of the Steve Jenkinson-Louisiana Elk of the Year Award. President Henry Daigle thanked the members of the association for giving him the chance to serve as their President for 2017-2018 and making this convention a great success. He also thanked Opelousas Lodge 1048 for hosting the Friday night social and dinner. The next meeting of the Louisiana Elks Association for the mid-season workshop is scheduled for January 18-19, 2019 at the Houma Lodge. The next annual state convention is planned for May 17-19, 2019 in Lafayette, LA and will be hosted by the Houma 1193.